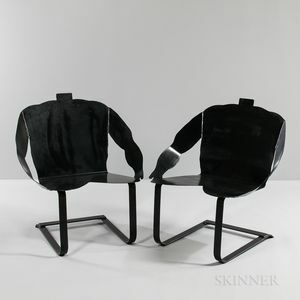 Two Philip Miller Steel "Much Obliged" Rocking Chairs, United States, late 20th century, ht. 41, wd. 29, dp. 35 in. Note: Part of a gallery exhibit at Santa Monica's Gallery of Functional Art in 1992. The California artist Philip Miller dubbed them the "Much Obliged" rocker, quoting a blues lyric from singer Taj Mahal: "you got a handful of gimme, and a mouth full of much obliged." The chair was designed to be completed with the head of the actual sitter. A total of thirty chairs were produced, and are included in a two-page portfolio in the book The Rocker by Bernice Steinbaum (Rizzoli, 1992).